The nice thing about Halo Wars 2 is that it works. Which is nicer than it sounds, because the biggest fear about real-time strategy games on a console, and the thing that generally keeps those games off the platforms in the first place, is that a control pad does not rank highly on the preferred methods of controlling an army quickly and accurately. Halo Wars 2—and, credit where it’s due, the first Halo Wars—prove that’s not necessarily the case. Here, within the confines of this game’s maps and demands, the Xbox One’s controller works almost flawlessly. And I do mean that; it’s a wonder to realize, not even five minutes after the game’s tutorial, that you’re sweeping the camera around, group selecting units and snapping back to bases and other armies with the flick of a button, just as you would if you had a mouse and keyboard. 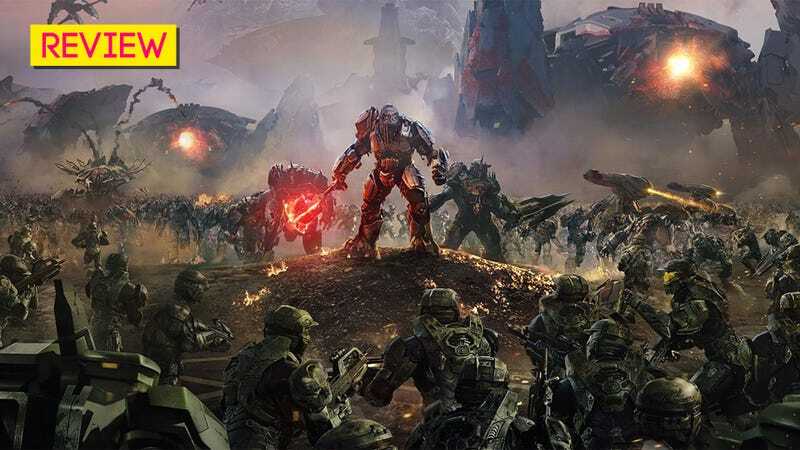 It’s an impressive feat, but the joy is short-lived, because in order to get the game’s controls working, Halo Wars 2—and in particular its campaign—has stripped the RTS a little too bare. Let’s start with Halo Wars 2's centrepiece story mode which is, for the most part, a bore. Sure, the controls get the job done, but they work in part because the game doesn’t ask much of them, with its linear missions and simplistic enemy encounters. The whole thing feels like a HD remake of a very old 90s RTS, the kind full of missions where you’d just walk a bunch of units from point to points lowly grinding past every enemy mob you encounter along the way. There’s a lot of real-time in Halo Wars 2, but not much strategy. The most taxing things you’ll be asked to contemplate are which order you’ll construct buildings and when you’ll call down support powers (like ODST squads, which you can see dropping in below, and missile attacks), otherwise progression in the game usually consists of building a bunch of units then throwing them at the enemy. Maps are small and cramped, so you rarely get a chance to try out tactics like flanking, and any strategies you could have developed around resources are nixed by the way the game handles them, since you simply construct the buildings that generate them inside your base. There are some glorious exceptions though, a handful of missions where, perhaps realizing where the strengths in both the game’s design and the license lie, Halo Wars 2 gives up on the idea of this being a hollowed-out RTS and instead go for something closer to tower defence. On these missions, where you’re tasked with defending a person or a base against waves of incoming bad guys, it’s a blast. Enemies attack down lanes, you have points on the map where you can build turrets, then you have to race around plugging the gaps in your defences with units. Everything good about the game comes together here, with the “snapping” camera controls and unit grouping system working wonderfully, and they’re the only times the campaign feels truly exciting. The rest of the time, though, it’s just...dull, a procession of busy work and unit-marching that seems more intent on serving as a multiplayer tutorial (elaborately explaining each new unit type that’s unveiled across the course of the missions) than as a tightly-paced standalone campaign. I played most of Halo Wars 2's campaign on Xbox One, because PC code wasn’t available as early. When it was, I swapped over to check things out, and found (this is my first time playing one of these fancy cross-platform Microsoft titles) that as expected it was a very cool trick, with the PC version syncing everything up with my Xbox One edition, from unlocks to save games. The PC version of course looks a bit nicer, and has mouse & keyboard support, which should make playing the game easier. Weirdly though, I quickly found myself reverting to the control pad, not just because I’d got used to it from starting on Xbox One, but because you can tell this is a game—like, say, sports games on the PC—specifically designed for it. Sure, the mouse and keyboard theoretically allow for faster and more precise control, but this is a game designed from the ground up—from its maps to its AI—with the controller in mind, so playing on PC isn’t the transformative experience it could have been had the platform got its own unique version of the game. It’s got some advantages, like grouping units and more precise selection of units in the midst of battle, but the way you sweep the camera around and build units/use powers works faster on the controller. Halo Wars 2's ability to be played on Xbox One and PC is a neat marketing gimmick, then, but it’s just that: a gimmick. This game’s focus, and reason for being, is the Xbox One. If you own a PC, there’s little reason to be playing this other than fanservice. Weighed against Xbox RTS titles Halo Wars 2 is a colossus. Compared to similar titles available on PC, though, Halo Wars 2 may as well have “Fisher Price” on the front of the box. The game’s design woes are a shame because they let down its fantastic presentation. Halo Wars 2 is a love letter to the series’ Bungie pomp, penned more directly and artfully than 343 themselves have managed with Halos 4 & 5. Perhaps because the story for this game involves old Halo characters using old Halo tech, everything looks, moves and sounds exactly like it would in an old Halo game, and it’s a joy seeing little references to the FPS games throughout, from a Spartan throwing grenades down a tank’s hatch to the use of the iconic announcer for multiplayer games. And as critical as I’ve been of the Halo Wars 2's 90s design on the battlefield, it shares some positives with traditional RTS games like Command & Conquer, in that its cutscenes are the absolute highlight of the entire package. So, yeah, unless you are an absolute Halo fanatic and will play this just for the story and characters, there’s not much in the game’s campaign to get your motor running. The multiplayer, on the other hand, is at least a bit more daring. There’s standard multiplayer stuff on offer, with deathmatches, games where you have to control points on the map, etc. Which is all fine, and playing against other humans (or even the AI in skirmish mode) presents more of a challenge than the scripting in the campaign missions, especially since some of the maps are a bit more expansive. I didn’t find anything that would keep me from other, bigger, better RTS games there, especially on PC, but then, my love for the Halo series has waned in the post-Reach years. Those still neck-deep in the fiction might find more fun in controlling squads of Spartans, or calling in a Scarab and seeing it lay waste to the battlefield. Where multiplayer gets interesting for everyone, though, is Blitz Mode, which depending on your views about card games and microtransactions will either be a breath of fresh air or an affront to the genre. Or both. In Blitz mode, instead of building units traditionally, you construct a deck of cards, with each card representing either a unit or power (like aerial bombardments). You’re only given a small number of cards at any one time in your hand, and you “play” them to make that unit appear on the map. You build decks by opening packs of cards, and here’s the thing: the packs are for sale. To be fair to Microsoft you get a lot of decks for completing the campaign, enough to get you competitive, but the aim here—with the ability to upgrade units the more times you obtain the same card—is to get you settled into this game mode before easing you into the idea of buying. Don’t look now, but your favourite video games are being infiltrated by the humble playing card. It’s a neat idea, but how comfortable are you with buying packs of cards for a real-time strategy game? And then relying on luck dictating which of those cards you could play at any one time? It would seem absurd, if I didn’t also know there will be people out there who will actually do it. Even at these prices. Also disappointing were the technical problems I encountered across both versions of the game. The Xbox One edition frequently locked up while loading missions, while on PC some multiplayer matches would cause the entire game to slow down; I’m not talking lag, I mean everything, from moving the camera around to drawing cards in a Blitz match, which in a competitive environment was hardly ideal. I just...don’t know why this game was made. I mean, I do, because Microsoft is very short on first-party video game releases in 2017, and are perhaps the only people on earth convinced that Halo is as relevant today as it was in 2007, and so are very intent on pushing this as a very big and important video game release. But it’s not. The lack of competition in the genre on Xbox, coupled with this game’s own problems, should be proof enough that RTS games are maybe just not for consoles. Something we knew after the first Halo Wars came out nearly eight years ago. You can trim and modify things around the edges to get them working at a functional level, which 343 and Creative Assembly have certainly done a good job of here, but at the end of the day what are you left with? You’re left with an RTS that doesn’t have much S, and a Halo game that despite its clear love and respect for the series its spinning-off from plays like genre cosplay. If you want to play a Halo game with the simpler story, backs-to-the-wall tone and cinematic flair of Bungie’s good ol’ days go right ahead and play Halo Wars 2. Just don’t expect the quality of the game to match that of the cutscenes.